How to draw Gin Ichimaru from Bleach Manga. Learn basic drawing technique for Manga and Anime from step by step basic drawing lesson. In this tutorial you will learn to draw a Bleach character Gin Ichimaru with basic instruction for beginners. Gin Ichimaru, 市丸 ギン, was the Captain of the 3rd Division of the Gotei 13 until he betrayed Soul Society. Gin is fairly ordinary in terms of clothing, and doesn’t wear any unique items. His overall appearance, however, is not as normal. He keeps his eyes constantly narrowed to slits, rarely ever opening his eyes enough to visibly reveal their bright sky blue-color. Gin is one of the most mysterious Shinigami in the series, since his almost constant smile and slitted eyes, combined with his heavy use of sarcasm and mocking politeness, make it very difficult to discern his thoughts. Many find his demeanor and appearance rather unsettling and there are very few who were willing to trust him even before he was revealed as a traitor. Whether you are a beginner or novice, the easiest way to draw is to observed your subject then break it down into simple shapes. I usually start drawing with basic geometry shapes to construct the subject’s head and body. By following this process, you will find drawing is lot easier. The key is to get the shape and proportion as accurate as you can in the beginning. Also make sure the shape of eyes, nose and mouth place in the right spot. I usually start of using basic egg shape as a base for character’s head shape, then next step would be figuring out the next geometry form to fit into the image. 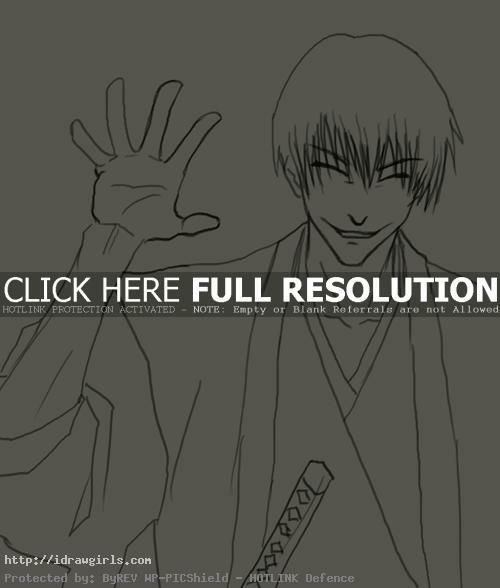 Below are step by step how to draw Gin Ichimaru from Bleach. Step one, I usually drew a basic egg shape with taper bottom. Then I drew a vertical line and two parallel horizontal lines for facial measurement. Step two, I drew his eyes inside the parallel lines. Then I drew nose and mouth along the vertical line. Step three, I then added his hair style and his kimono. Step four, I began constructing his right hand. Step five, I finished up the hand drawing and the rest of his arm. Step six, I finish up the rest of the image.